old-fashioned school desks are really cool. i was super excited to get my hands on one a couple of years ago from my Father-in-Law, who found them at an old, abandoned elementary school. we use it every day; it's where BigGirl sits to do practically all of her school work. the only thing is...the desk top is slanted, causing her pencils and crayons to roll all over the place. we had a pencil falling problem. it was funny at first. whoops! there goes the pencil again! but when it was interrupting her school work because the pencil was constantly rolling off onto the floor, i had to do something. yarn + Scotch tape + pencil = Stay-in-Place Pencil! the tape and yarn help keep the pencil from rolling but if it does roll off or get knocked off the desk, all she has to do is reel it up. and it works for me. 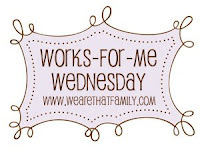 if you like helpful household hints, you'll love Works For Me Wednesday at We Are THAT Family.